Walt Disney World opened 45 years this month. That’s amazing. Though the years things have changed. In 1971 the Magic Kingdom was the only park. Change is a good thing, but at times it can be very sad when a very loved attraction is closed to make room for something new. 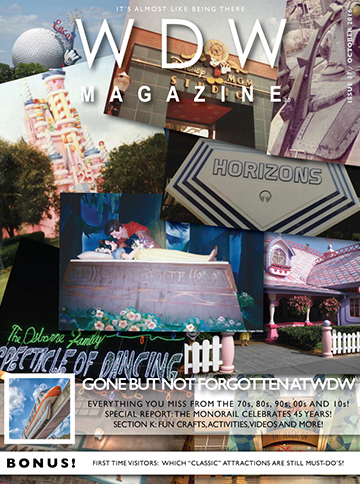 This month we take a look at those closed attractions as we celebrate Gone but NOT Forgotten at WDW. I’ve got to say, I’ve been looking forward this issue for a long time. Over 45 years a whole bunch of attractions have come and gone. We thought the best way to honor them would be to look at them by the year they opened. We’ve gone decade by decade through and looked at each attraction that has closed. From the 70’s to the 80’s, the 90’s, 00’s and even the 10’s. Which one is your favorite? This month we kick off Helping Hands by looking at which “Classic” attractions first time visitors shouldn’t miss. 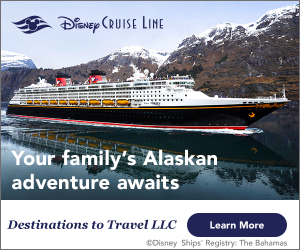 Then we look at whether to splurge and try a Signature Restaurant and we wrap up with a look at what to pack for a fall or winter trip to Walt Disney World. That’s pretty helpful. Our featured attraction this month is really cool. It’s Talking Mickey in the Magic Kingdom. What fun. Then we head over and find out the top 10 reasons we LOVE the Wilderness Lodge. Have you ever eaten at Victoria and Albert’s? What a grand experience. The gift shop this month is very sweet. It’s Zuri’s Sweets Shop. The FanZone leads off with a look at the attractions you miss. How fun was that? Then we take a trip over to ‘Ohana and look at how to make those yummy Maui Scalloped Potatoes. I’m drooling just thinking about them. In our Vinlymation and Tsum Tsum Corners, we look at some Classic Disney Vinylmations and Tsum Tsum’s. Finally we close the FanZone with our monthly Photo Contest. Did you win? One of my favorite things at Walt Disney World is riding the monorail. I’ve always been fascinated with it. Every time I hear it whisking through Epcot I have to look and see what color it is. I love the monorail. This month we are taking a very special look at my favorite attraction as Judd Helms, one of our Photography Team showcases this true Walt Disney original. The kids are going to love this month’s Section k! It starts of with Wally D being his usual mischievous self. Landon and Callie get a HUGE surprise when their cousin Sadie sings a solo in Disney’s Hollywood Studios. You have to see this! In Bring the Magic Home we learn how to make Disney Princess silhouette prints to decorate the kids rooms. Be sure to download the games and coloring pages. They are downright fun. With the big birthday celebrations going on Around the World is full of fun. It begins with a look at the latest WDW News. Then we take a trip down Main Street on the Trolley. How fun is that? Do you know who the first guests at Walt Disney World were? How would you like to have been them. Our Did You Know article covers that and lots more. In Outside the World, we head over to the largest Hard Rock Cafe in the world. Yes, the one over at that other park we don’t mention. That is one big and fun issue. Well, go on. Get started.